I Blame the Cats. Always. | But I Digress . . . I Blame the Cats. Always. I used to live in a drafty log home on a windy hill. There were plenty of odd noises, especially at night. Now I live in a regular home in a windy valley, with lots of clutter. There are still plenty of odd noises, especially at night. It’s been my policy to blame the cats (usually from three to five of them) for any noises – rattling, thumping, skittering, whining, tapping, crashes, howls, et cetera, etc. Even if every cat in the house is occupying my lap at the time, I still try to find a way to blame it on them. One night, however, my husband and I were peacefully sleeping, when I thought I heard a noise in the living room. Whatever else they do, cats don’t whisper. For once I couldn’t blame them. It had to be burglars, discussing what they wanted to take or which house to hit next or why we had such crappy stuff and was any of it worth anything. I didn’t want to wake my husband, because then I’d have my N.O.W. card taken away, so I tried to remember where we put the baseball bat and extended my hearing as far as it would go. I crept closer to the bedroom door, where I could hear the sounds better. Then I realized that there was indeed whispering, but that it was in French. Even in my fearful, groggy state, I couldn’t believe that there were actually burglars in my house, in Ohio, speaking French. So I tiptoed into the living room. If for some unlikely reason, there were French-speaking burglars, I could astound them with my knowledge of French, threaten to call the gendarmes, or at least ask them for directions to the library. When I tentatively poked my head into the room, however, I found that the television was on and a foreign film was playing. Hm. My husband won’t watch foreign films because the subtitles distract him. Besides, he was asleep in bed. Then I realized what had happened. Someone had activated the remote and selected a film channel. With the sound very low. Although I couldn’t name the culprit, it was clearly Matches or Maggie or Chelsea or Shaker, all of whom were giving me the “Who, me?” look. There was no use dusting for paw-prints. One of them had done it, or they all cooked up the plot together. It wasn’t me. Maybe it was the dog. Oh, we don’t have a dog? Maybe it was the neighbor’s dog. So the one time I knew it couldn’t be the cats, it was. Now I blame them for everything. Always. Who knew cats could read subtitles? I always blame my cats too…and when I ask them about it they emphatically blame the dogs. The dogs look guilty. Found you from the Bloggess. I will be back. I love cat stories! 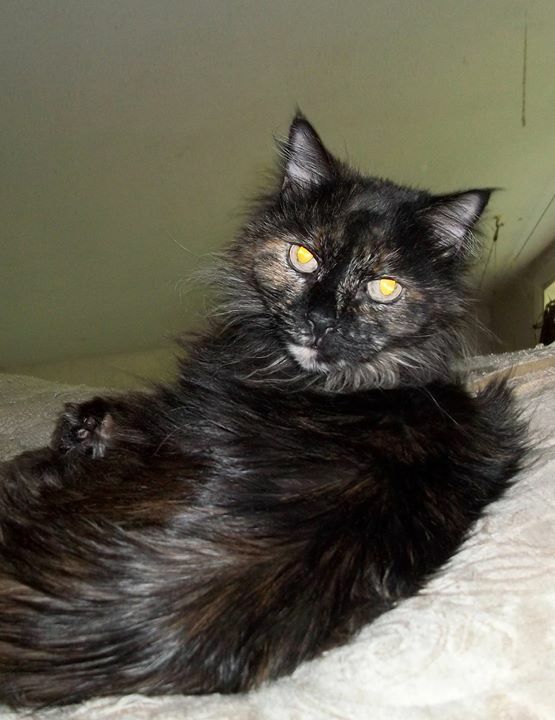 I don’t always do cat stories – this is kind of a general purpose blog. But when I write cat stories, this is where I put ’em. And I have lots. So thanks for visiting, and keep checking back! I did notice you did more than cat stories…still coming back, a cat story will just be a bonus! Your cats didn’t hear this from ME, but if you happen to have one of the cable companies that has a remote access app (for example, Time-Warner), you can prank household members by changing the channel on them even when you’re not at home. Very useful if someone at home had promised to shovel snow or mow grass but you’re quite sure they’re watching the ballgame or that Game Of Thrones marathon! Good to know. But the incident occurred in the days when the remote was actually connected to the TV by a wire. Primitive, but it did make it easier to find the remote in the sofa cushions.